"With gwabbit, we’re not going into a meeting with an attorney worrying about lack of data and outdated data. No one will get caught with a lack of something to show an attorney." "gwabbit has been invaluable in helping us capture and identify relationships that weren’t previously identified in our CRM, InterAction. This has honestly exceeded our expectations." "gwabbit is our best kept secret..."
"Our vision was for a holistic approach to CRM and a system that was easy to use and could be embraced by all. We recognised that a well implemented CRM system could help to strengthen the service we offer our clients. gwabbit is a key component in that mix as it helps us to measure the relationships we have and identify business development opportunities." There’s no shortage of confusion in the industry regarding GDPR. 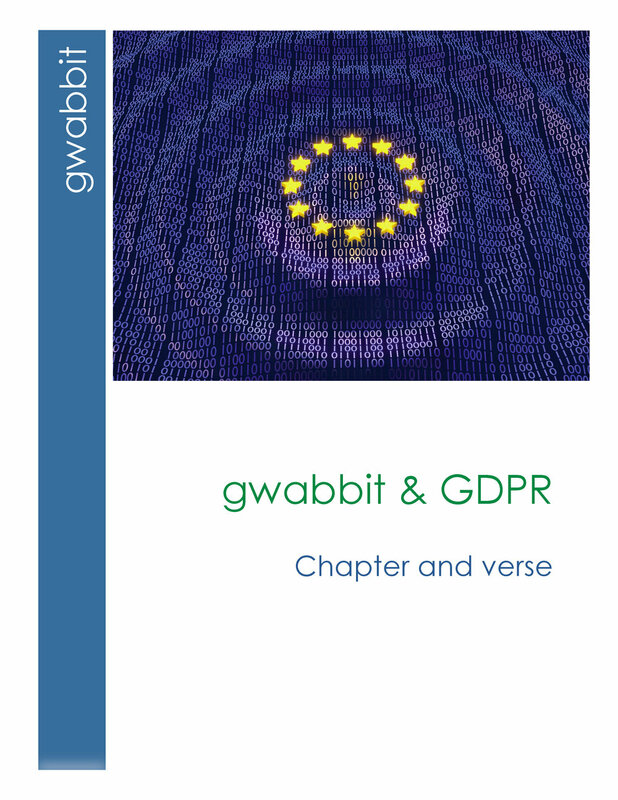 The purpose of this document is to provide clear information regarding the role gwabbit plays in GDPR compliance, both in data capture and data retention policies. This document also illustrates the issues associated with traditional address book-sourced CRM models as a result of GDPR. A virtual encore presentation of gwabbit's ILTA 2017 Big Data Power Lunch with guest speaker Christina Fritsch, J.D., CRM Success Consultant and Founder of CLIENTSFirst Consulting. McGuireWoods' Chris Mann's encore presentation of his 2017 ILTA Big Data Power Lunch discussion. AmLaw's #17 firm added over 100K new high value contacts and relationships with gwabbit, updated 80K InterAction contacts and slashed email bouncebacks from 16% to 2.7%! Take a quick tour of "The Blue g," gwabbit's optional Outlook utility that enables users to quickly add and update email signature contacts to their Outlook address books while simultaneously sourcing contact and relationship data to the enterprise CRM and gwabbit ERM reports. gwabbit trotted out its latest release during our 7th annual ILTA breakfast meeting. In this 2 minute video, learn about gwabbit's new email Alert, email activity Dashboard, and the latest enhancements in our ERM 4.0 solution. Join our special guest, Jesse McNeil, Marketing Technologist at Holland & Hart, as he takes you on a tour of his custom relationship management solution. Holland & Hart has taken ERM reporting to a whole new level, creating a custom template that supercharges gwabbit heat map data to create a bird’s eye view of the firm’s relationships with its clients. Meet the world's fastest data steward, Ice Miller's Mercedes Potter, who processes InterAction contacts at a blazing rate of 480 contacts per hour using gwabbit DQM.